A recent study of the tiger genome [he links to this in Science Daily: Genome-wide study confirms six tiger subspecies] confirmed that there are six extant (still in existence) subspecies of tigers; Bengal tiger, Amur tiger, South China tiger, Sumatran tiger, Indochinese tiger, and Malayan tiger. This new knowledge will aid in conservation efforts. But it also has an interesting creation connection, confirming exactly what we would expect starting with God’s Word. Evolutionists have long thought that species take hundreds of thousands to millions of years to form. [Not all of them.] In contrast, young-earth creationists believe that tens of thousands of new species formed from the “kinds” on board the Ark — and that this process took only about 4,500 years. For example, the over 5,000 mammals species alive today (e.g., elephants, giraffes, zebras, tigers) arose in just 4,500 years from less than 200 mammal “kinds” on board the Ark. Which view is most consistent with the evidence? Young-earth creationists expect species to still be forming today — at appreciable rates. [Huh?] Consistent with this expectation, over 6,000 subspecies of mammals exist — more than the number of mammal species. Since subspecies are populations of creatures that are almost new species, this indicates that thousands of mammals around the globe are but one step away from becoming new species. Though the authors [of the study Hambo mentioned] use evolutionary assumptions to stretch the origin of these subspecies to one hundred thousand years, the fact that so many subspecies exists is a smoking gun for their recent origin. Fossil evidence shows that tigers go back two to three million years. But, the genomic evidence shows that all living tigers only trace back to a time about 110,000 years ago, when tigers suffered a historic population bottleneck. It’s exciting to see even more research that confirms what we would expect, starting with God’s Word. This tiger research is good observational science. The evolutionary baggage is nothing more than a faulty interpretation of the evidence. But the research is actually much more consistent with a biblical view than with an evolutionary one. And this is exactly what we’d expect since God’s Word is the true account of history. We can’t think of anything to say. How about you, dear reader? Apparently the Hamster missed the significance of the word “living.” All the evidence shows that there are many extinct tiger species and that tigers as a group experienced a major population crash (for reasons not stated here). Huh? How? Subspecies appear much more quickly than full-blown species do, but they appear all the time and then either die out, hybridize or evolve into new species–so their number at any given time means little. I don’t know what Ken Ham has been smoking, but it obviously isn’t helping his IQ. And Jeansons book (Replacing Darwin) is laughable and known by experts to be based on completely made up numbers about the mutation rate. But hey, if he wants to publish in a peer reviewed journal, we’re all ears…..
Let’s assume that we start with one species 3.5 billion years ago and it simply splits into two species. Then the two become 4, the 4 become 8 and so on. After 30 ‘splits’ you will have over 1 billion species. The upshot: the data we have on species formation shows that there’s been plenty of time – time for evolution to have created a billion or even 100 billion species. Ah yes, we are right because they are wrong and we don’t need to explain why. Flood creation science, and only Flood creation science, predicts that species diversify at such a rate that all species we have today arose , much smaller number in the interval between the Flood, and, say, Aristotle’s or at the latest Jahiz’s zoology, some 2,200 or add the most 3,000 years. But now it’s been demonstrated that tigers have split into subspecies within the past 100,000 years. Therefore Flood creation science has made an accurate prediction, and we all need to revise our ideas accordingly. An exercise for the reader: count the fallacies. The only difficulty is why do people accept such nonsense. We know why people produce such nomsense: because they can get away with it. It sells. And it is a whole lot easier than going to the work of thinking, and of making thinking accessible to an audience. Never mind how many mammal ‘kinds’ were on the Ark, how did they get to Australia? Where`s the trail of fossils? @Ross Cameron, I thought everyone knew that they were transported there after the Flood as a result of the breakup of Pangaea. Not only the whole of Cenozoic evolution, but the whole of plate tectonics since the Permian, took place during times described in the Bible, but without anyone noticing. Great link, PaulB. Somebody should send it to Ol’Hambo (for entertainment purposes of course). I was on a quiz show once. One of the questions was: what is the record number of times Ken Ham has used the phrase “God’s Word” in a single online post. I answered correctly: ninety-seven. I won a stuffed tiger. PaulB’s link poses an interesting challenge for non-Americans like me. What’s the worst tourist trap in the Netherlands? There are quite a few candidates. Gazing at prostitutes in the Amsterdam Red Light District in the company of way too many other gazers is a good candidate. There is also the original Ark in Dordrecht, with even less attractions than the Gay Wooden Box of Kentucky. Of course the “harbour” of Volendam must be mentioned as well. 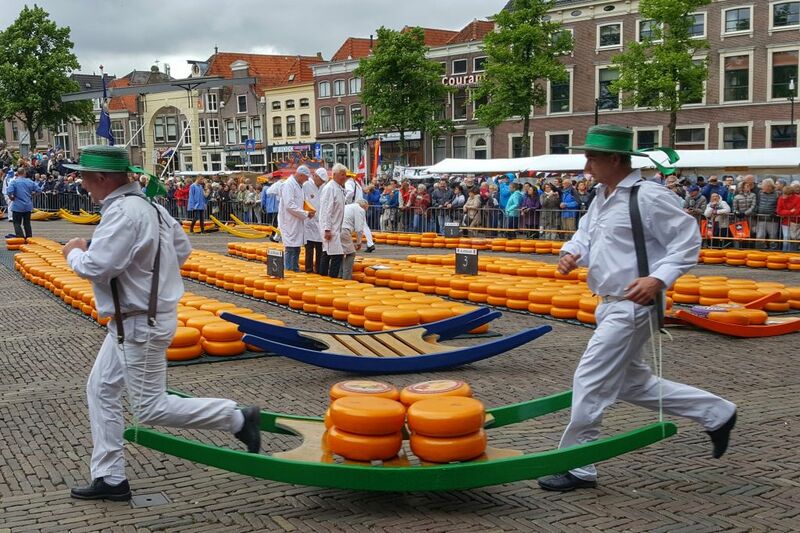 My candidate though is the cheese market and especially the one in Alkmaar (I’m not familiar with any of the others). For an hour or two you can look at a bunch of oddly dressed guys uselessy running across a square, pointlessly carrying and moving wheels of cheese. The idea is that the tourists buy that cheese, which costs twice as much as in the supermarket (less than a five minute walk) while being exactly the same. No wonder all locals carefully avoid the Waagplein at Friday morning. So PaulB, what has Scotland to offer in this department? And how about Australia? You’ve got to hand it to Nate Jeanson. Never let the facts stand in the way of a good argument! Particularly when you’ve got Kenny Ham breathing down your neck. But Nate is such a nice guy. What’s he gunna do, tell Ken that he isn’t qualified to comment? No way, not on your life! Nate’s the kind of guy who’ll go out on a limb. So what if he doesn’t have any relevant experience. He managed to write a whole book without knowing anything about fossils or evolution and stuff. So a couple of tigers… chickhen feed. This Ham post is mind-numbing. To start with their ‘created kinds’ (ie what was originally created was not species) narrative is pure pseudo-science – and it’s not even taught in Genesis. It’s a made-up ‘fact’. Invented to concoct a false history of speciation on this planet. And if you don’t start with the Bible you would expect what, exactly? No sub-species? Ken Ham does not tell us. I suspect he knows that you don’t need the Bible to be able to know about or understand subspecies. He and his sidekick Jeanson are career liars and enemies of science and history churning out propaganda to con the gullible and the bigoted. 110,000 years ago (now read after I re-produced my comment of yesterday at AiG’s ‘Answers News’) being not ‘recent’ (certainly not just 4,500 years ago). ChrisS The full Ham phrase is ”what we would expect starting with God’s Word”. So it’s normally stuff made up by him and people who work for him. Their ice age being a case in point. God’s word did not teach an ice age – before we knew there were ice ages (before the Bible was even written). The newly identified sub-species are not that different from each other. They can interbreed and hybrids are fertile. If they lived together, they would quickly merge back into one species. It is only geographic separation that makes them a little bit different from each other. One of the reasons for bothering to identify them as separate sub-species is that conservationists can then claim all 6 types are endangered, and get more resources to preserve all 6 of them. It would seem to have nothing to do with Ham and his kinds.